Sun bear Goldie was rescued as a cub four years ago, and this video shows just how much he loves his new life. When sun bear Goldie was just a cub, his mother was killed and he was trafficked across the border from Laos into Vietnam. He would have spent his entire life in complete misery as an exotic pet. His whole world would have been a single barren cage. He would never have played in the forest, never foraged for food, built a nest or climbed a tree. He would never have lived. But thankfully, forest rangers intervened and Goldie was transferred to Animals Asia’s Vietnam sanctuary. Here he has grown into a beautiful, healthy young bear whose whole world is one big playground. Goldie is surrounded by friends Annemarie, Murphy, Layla and Sassy in Animals Asia’s Miomojo Cub House. His outdoor enclosure is filled with trees, swimming pools and climbing frames. 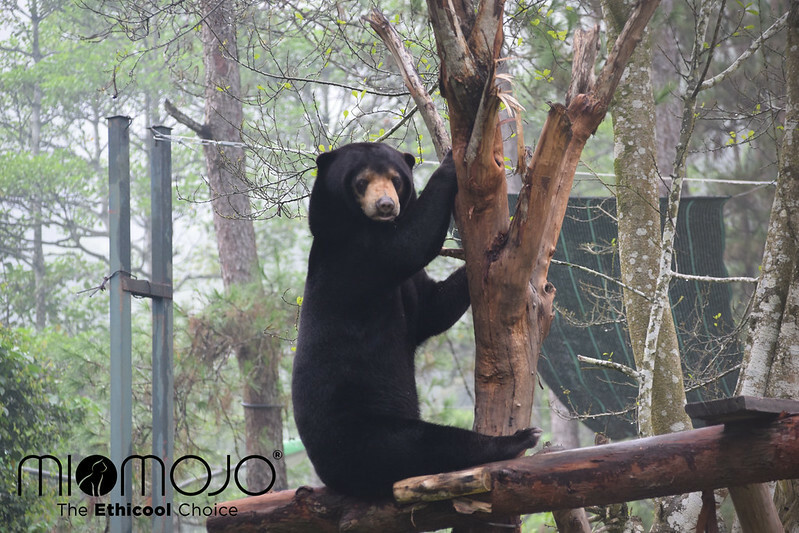 He is able to express natural behaviours such as foraging and is given emotional support from his four bear friends – a situation made possible by the generous support of Miomojo, a fashion company which currently sponsors all five bears. Goldie and his close friends Murphy and Layla are all now around four years-old, while playmates Sassy and Annemarie are eight and nine, respectively and are able to act as positive older female figures to the youngest bears. We look forward to seeing this little “family” grouping enjoy many more years of freedom and playtime together. The Miomojo Cub House is part-funded by Miomojo – a responsible fashion company from Italy making gorgeous fashion accessories that don’t harm animals or the environment. Their new Ethicool collection is available now.